In celebration of International Museum Day, the Philippine Science Centrum opened its door to bloggers last May 16, 2009. Not only was I able to go enjoy the country's first science museum for free but I was also able to bring my husband and blogging son with me. Bloggers @ PSC (Philippine Science Centrum) aimed to spread the word about this awesome place to more people especially those in the cyber world. Well, that's what bloggers do best, don't we? My family were the first ones to arrive in PSC. We had a smooth ride coming from Cainta to the Marikina Riverbanks. I'm glad that we did not have the usual weekend Marcos Highway traffic. Finding the E-Com building where PSC is housed did not become a problem at all because of the numerous road signs pointing to the Philippine Science Centrum. Instead of parking our car directly in front of the Riverbanks Mall where the parking rate is on a per hour basis, we went to the covered parking area at the back of the mall. It turned out to be the parking area nearest to the PSC entrance. After registration, we were led to an area where our heads were chopped off and served on a fruit platter. No, just kidding. If my head was chopped off, I wouldn't be writing this post,right? The head on a platter table was just part of the Vision and Perception exhibit that demonstrates how mirrors can cheat our perception of what's real or not. The PSC staff led by Ms. Edicel Herrera and Cognition Creative peeps Patrick and Lalah prepared a guided tour for us bloggers. Next, we were able to see ourselves move in zero gravity by using the Anti-Gravity Mirror. It's not magic that made us levitate, just pure science! After that, we played with the Laser Harp. This harp is not like the usual harp because there are no strings to pluck to create music. Laser sensors send signals to the harp's microchip to play the corresponding note. Body Beat is another musical exhibit. Two or more persons touch the metal balls and then tap the skin of each other to make music. Boy, this really made these men feel like little boys again! I had the chance to be in the spotlight because the Van de Graaff Generator needed a volunteer with long hair. It looked scary at first because I thought that I would be feeling an electric current run through my hands in the process. It was literally a hair-raising experience! Before we went on to the Space Gallery, we passed by the Children's Gallery where little kids can stay and play for a while. The Space Gallery had the interesting exhibit called "Your Weight On Other Planets". It was a funny relief to know that I would weigh a lot less in other planets! Ralph also had the surprise of his life when he discovered that he would be as light as a feather in Pluto! There was also an exhibit that showed a model of the Solar System. Visitors can view the facts and other interesting information about each planet by viewing them from monitors available below the model. My boys enjoyed staying inside the Wonder House while it made me feel a little nauseous. The house was apparently tilted by 18 degrees but in there, I didn't even notice it in terms of what I saw as everything looked upright. I just had this sensation of falling! This exhibit definitely tested my sense of balance. Talk and Listen enabled me and my Big Boy to talk to each other even when we were a few meters apart. The sound was so clear even when he just whispered what he said to me. Ralph rode a bike with Kelly the Skeleton in the Watch Me Pedal Exibit. Through Kelly, we were able to see how our bones move while biking. We also had a great time making shadows at the Frozen Shadow and Colored Shadow exhibits. Look at how Ralph bonded with the other guys in our group. We also saw how the Tesla Coil generated lightning arcs. An open forum was held afterward inside the Conference Room. There, we were able to ask questions and discovered more of PSC's programs one of which is the Traveling Exhibition. The Traveling Exhibition brings at least forty interactive exhibits from the PSC to schools or town halls even in far-flung areas of the country. There are 4 available sets of Traveling Exhibits. These are the Adventures in Discovery, Sci-Fun Caravan, Science on the Move, and Science Works. We truly had a great time at the Philippine Science Centrum. It was my first time to be actually inside the country's first interactive science museum although I already had glimpses of it when they were still in the UP Manila campus. The building where they were a few years back was the same building where our PE classes were held. For us, visiting the Philippine Science Centrum is considerably a great alternative to going to the SM Science Discovery Center. Tickets are cheaper by a mile at a hundred bucks each. The place is also just a few minutes away from our home. However, please be advised that the place has no airconditioning and the exhibits are not that high-tech as SM's but, nevertheless, still as interactive. After visiting the PSC, you can take a stroll and enjoy the cool breeze at the Marikina Riverbanks or have a shopping spree at the Riverbanks Mall. 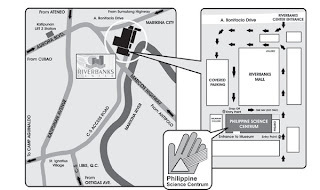 The Philippine Science Centrum is located at the E-Com Building, Riverbanks Center, Barangka, Marikina City. It is open from 8:00 a.m. to 5:00 Monday to Saturday. For more information, you can visit their website. Below is a vicinity map for your convenience. Thank you for this info. We often go to Riverbanks but I never knew about this place. Good thing I read your blog.